Ok so first up is the Lush “9 to 5 cleanser”: Before I purchased this product, I had heard so much hype about it. Lots of other bloggers that I follow were raving about it and said that it was one of the best cleaners that they had ever used…I gotta say…It totally lived up to the hype. As you may know from previous posts, I have really sensitive combination (which means both dry and oily) skin so finding a cleanser to suit me perfectly is a really tricky task. This cleanser is really gentle on my skin, it is made from all natural products including Orchid oil, Almond oil and Ylang Ylang oil, all targeted to calm and cleanse your skin. I use this product twice a day, once in the morning and once at night. I smooth a dab of it all over my face using my finger tips. (the trick is to rub it in upward gentle motions to really work it into the skin) and then i remove the excess with a cotton pad. It leaves your face feeling really clean but also really moisturised and soft. I will be purchasing this cleanser from now on and I really recommend it for people of any skin types! Lush Eau Roma Water toner: To be completely honest, I have never really bought into the whole toner idea. I found it just an extra unnecessary step in the skin routine. However, when I went into Lush about a month ago, I had a veeeery long chat with one of the girls working there about my skin type and my skin routine. She explained how important toning can be for the skin especially for my skin which is often prone to blemishes. It helps to get rid of an excess cleaner that may be left on the skin and which can often lead to the blocking of the pores and therefore a blemish. It also calms the skin and gradually evens out the skin tone. There’s a wide range of toners available in Lush that cater for each particular skin type. I was told that the Tea Tree oil toner is perfect for people who suffer with spots badly or with oily skin. The toner I was recommended, was the Eau Roma toner which is specifically for people with dry or sensitive skin. It comes in a squirty bottle and the constituency is pretty much just like water. It has a very light fresh scent and is made from ingredients such as rose and lavender water. Again, I use this twice a day, morning and night. I just spray a few squirts onto a cotton pad and gently wipe all over my face and neck. The great thing about this is that it’s really refreshing, so it kinda wakes you up in the morning and then after a long or tiring day it really refreshes your face at night. I have my toner in a 100g bottle but you can also get it in a 240g I believe but it really lasts a long time. 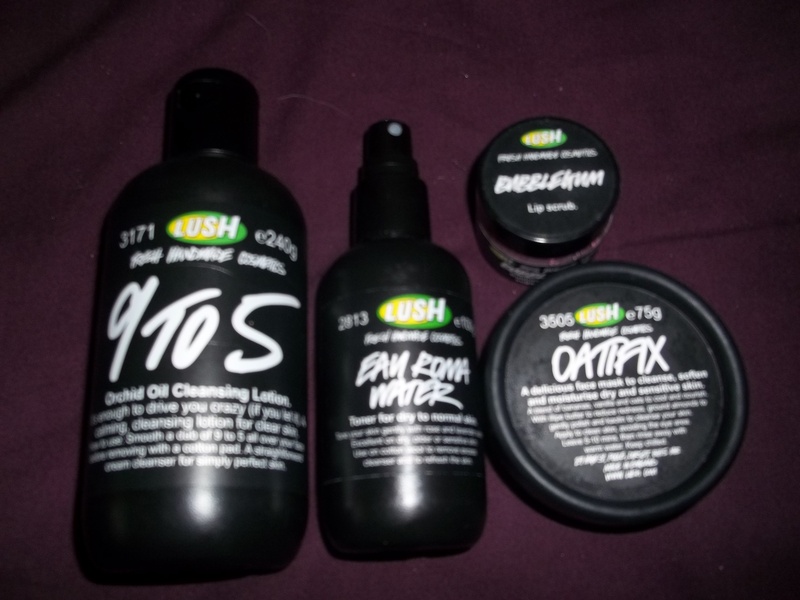 Lush Oatifix face mask: In lush you really are spoiled for choice when it comes to face masks. Just like the other products, each type of face mask is specifically catered to or targeted for a specific skin type. The face mask that was best suited to my skin was Oatifix. This face mask is perfect for dry or sensitive skin. It’s very calming and contains small almonds which work great as an exfoliator. I gotta admit though, what attracted me to this product was the smell. It is just amazing. It contains oats, almonds, honey and bananas and is so good that I have trouble not eating it. I am aware though that scent is a very personal thing so this might not be to everyone’s taste so make sure you like the scent first before purchasing. This product comes in a small roundy container and because it contains all natural and fresh ingredients it must be kept in the fridge. I try to use this about twice a week but it’s really up to you how much or little you want to use it. I just spread a small amount of it onto my face (avoiding the eye area) after I have cleaned and cleansed my face but before I have moisturised and then I leave it on for about 10minutes. I find it’s great to use when you are having a bath as its really relaxing or just after you’ve had a shower as that’s when your pores are open. Lush Bubblegum lip scrub: I actually heard about this lip scrub weeks before I purchased it and was so excited when I actually got it. It’s a very straight forward product and basically does what it says on the label… it is a lip scrub.. which is basically just an exfoliator for the lips. All you do is rub a small amount gentley across your lips in small circular motions. This gets rid of any dry skin on your lips leaving them really really soft and smooth. It also causes the blood to rush to your lips leaving them looking plump and fuller (which is always a bonus). Always follow this scrub with a lip balm ( my personal favourite would be the Carmex cherry balm or Burt’s Bees) and voila you’ll have perfect smooth lips. I usually use this once a day but you can use it as many times as needed. The best thing about this product is that it’s edible, its made from real sugar so you can lick it off your lips after you use it and mine tastes like Bubblegum but I believe you can get it in other flavours.